The Big Show of Little Art, AKA the 8 x 8 Community Open Exhibit, is coming up fast so it is time to get your artwork ready for submission. For all the entry details, see the Call to Artists. Then download the Entry Form, fill it out, print it, and bring it with your artwork to submit it at the gallery. 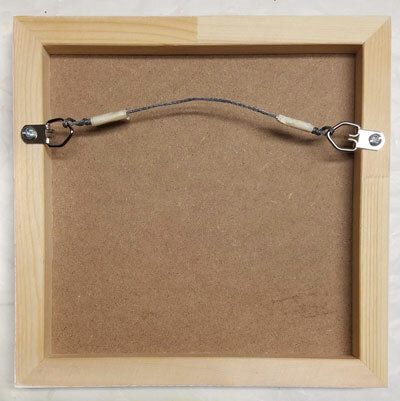 A reminder – Be sure to properly wire your paintings and other 2D artwork. Example below. Gallery Calapooia Inc. receives support from the Oregon Arts Commission, a state agency funded by the State of Oregon and the National Endowment for the Arts. Gallery Calapooia has received support for this exhibit from the Linn County Cultural Coalition. This entry was posted in Gallery on November 15, 2018 by Rob Robinson.